King Solomon had harsh words for those who lie, cheat and defraud others. God hates “a heart that deviseth wicked plots,” he tells us in Proverbs 6:18, and many other verses share that sentiment. Ever since Solomon’s time, righteous people have been dodging those wicked plots. 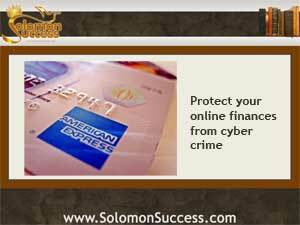 But in the age of the Internet, it’s easier than ever to fall prey to that kind of plot when conducting financial business online. Since cyber crime costs an estimated $100 billion worldwide every year, here are some simple strategies to keep your finances safe online. You check your bank account via your smartphone or pay your credit card bills on your laptop while on vacation. But cyber fraud experts warn that the more devices you’re using to access your accounts, the more vulnerable you are to hacking. It may seem a little outdated, but for maximum security, dedicate one computer to your finances and conduct all your business there to reduce the chances of anyone getting access to your accounts. It’s hard to remember a batch of different passwords, so most people stick with just one or two that they use for everything from checking bank accounts to going on Facebook. But that’s a mistake. Make sure that passwords relating to finances are different from the ones you use for other sites – and be sure that they aren’t obvious ones, like your birth date or a child’s name. Change them frequently, too – and don’t let the computer store extra-sensitive ones.